Thank you all for your great and tremendous support for the book published last year. It is brought to your notice that the new version 2.144 of the "DISCOURSES" book has been published with more examples and more practice questions. 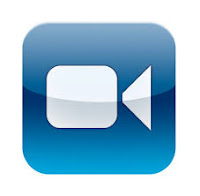 We supply online "FREE VIDEO LESSONS" on Discourses. Many efforts have been taken care of in preparing this book. It is really different from any other book. One definitely loves it. It is prepared for the students. It deals with the discourses only, not the pedagogy. 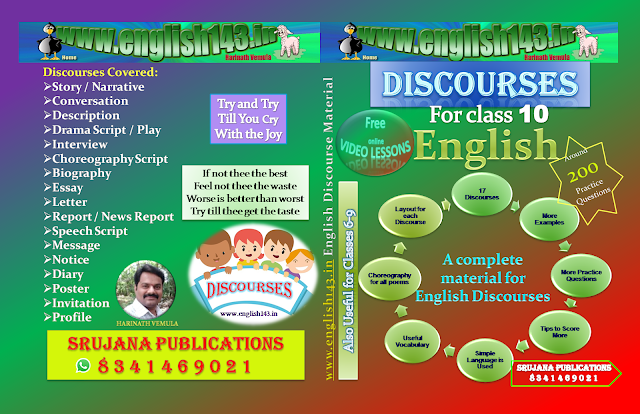 I believe that it would be helpful for both the children of Telugu medium and English medium. After making use of this book you can send your own or your students work to my whatsapp or mail so that it will be published on this blog with your name and address and will be helpful for others. Hope you support the community. To get updates of "Discourses Video Lessons"
Name of the student: …………………………………………………………………………… Roll No. ………………. Read the passage and fill in the blanks with suitable option given under. He was short. He ……… (1) sharp. He was …….. (2) brightest boy ……… (3) his class. His seniors used ………. (4) ask him to ………….. (5) their difficulties in science. He could have ……….. (6) unnoticed in ………. (7) crowd, but once you …………. (8) him a question related to Physics ……….. (9) Maths, there was a spark in his …….. (10). He could grasp theories of science faster than the speed of light. v Choose the most appropriate one word substitutes for the following and fill in the blank. 1. Ramesh is an ………………… He is a person that cannot be corrected. 3. Sahithi has faith in God. She is a …………………………..
5. Shiva ha many talents. He is a …………………. 6. A sentence whose meaning is unclear is called ………………….